We REALLY want you to know where your food comes from! 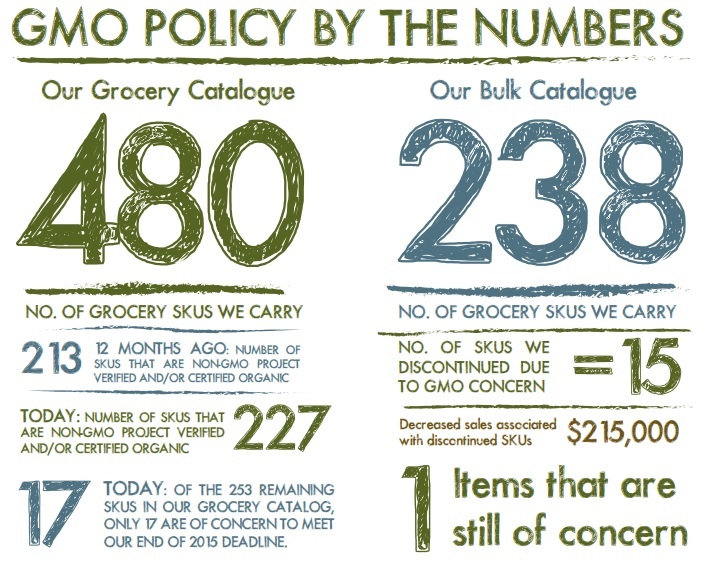 We have learned much in the last twelve months as we continue to operationalize our public commitment to ensure a non-GMO catalogue. We’ve been learning alongside the brands, consumers and certifiers who are spearheading this movement toward a healthier and more transparent food system. Here are the bullet points. If you are interested in the deeper details, see the full report here. Everything takes longer than you think it will, especially verification! Our own Hippie Foods products took from June of last year until March 2015 to get through verification. We can be influencers and even help other companies become Non-GMO themselves. With our existing brands, we’ve successfully advised on what ingredients to avoid in new products under development. It feels great! Just because product is “enrolled” in the Non-GMO Project doesn’t mean it will pass. Verification is vigorous. We learned the hard way that a myriad of reasons can pop up and prevent a product from moving from enrolled to passed. Non-GMO Project verification and GMO-free are inherently different concepts. The term GMO-free suggests no GMOs are present, which could mean there were GMOs and they were removed. Non-GMO Project verification means the product was created using a system that avoids GMOs. In some categories including animal proteins and cleaning products, the supply chain is not yet catching up to consumer demand. The gap between supply and demand for Non-GMO animal products really challenges our policy deadline. We have decided to extend the deadline on animal products to December 31st, 2017. This parallels the Whole Foods deadline, and it is our hope that this extension will give producers and the Non-GMO Project time to resolve the issues, or for supply to catch up. If you want to know more, please just ask us!